Here’s another recipe that I’ve been wanting to make for a verrrry long time! Yes, a potato and onion pizza! I really should make an official list, because there are SO many more. 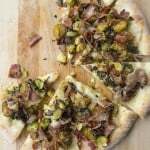 I’ve seen this potato and onion pizza around the blogosphere and it caught my attention. But, this sat on the back burner for a while for many reasons. Having said that, I’m really glad that I tried it! First, I want to say that this dough is super challenging to work with, for even the most advanced bread baker! Although, I loved the challenge. The dough starts out as a batter (!! 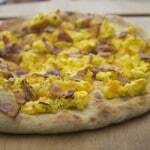 ), and you will scratch your head thinking how in the world will this make a pizza base? After mixing for several minutes, it will transform. This, my friends, is a great lesson in gluten development. 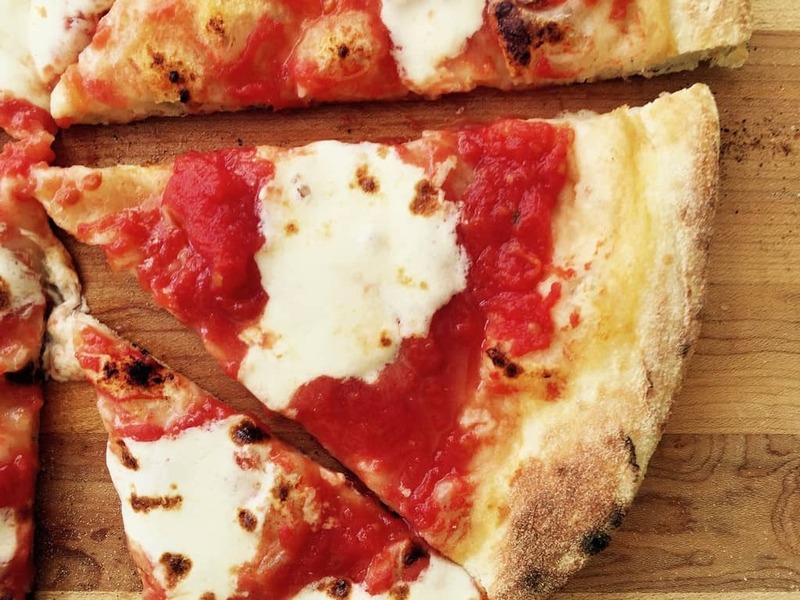 If you’d just like to use an easy-to-make pizza dough, try the NY dough. 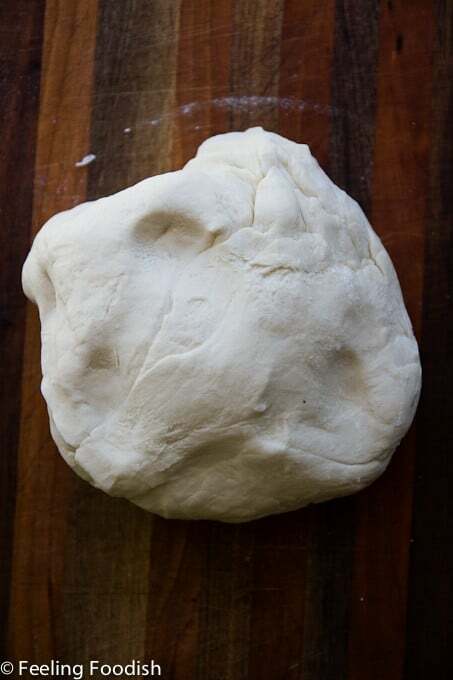 The dough then sits for proofing until it rises sufficiency. 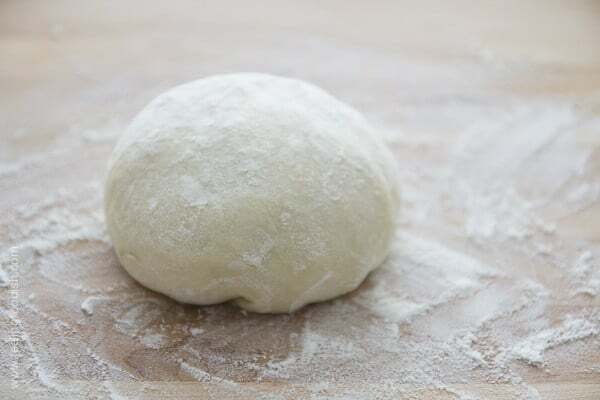 After stretching, you will let the dough rise again. While this is happening, prepare your potatoes. 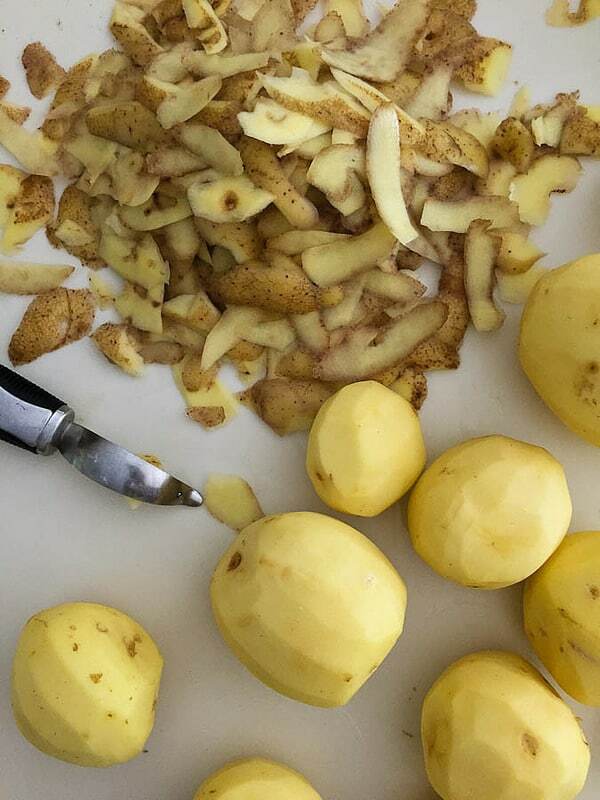 Now, the recipe that I used called for “about 4 pounds” of potatoes. 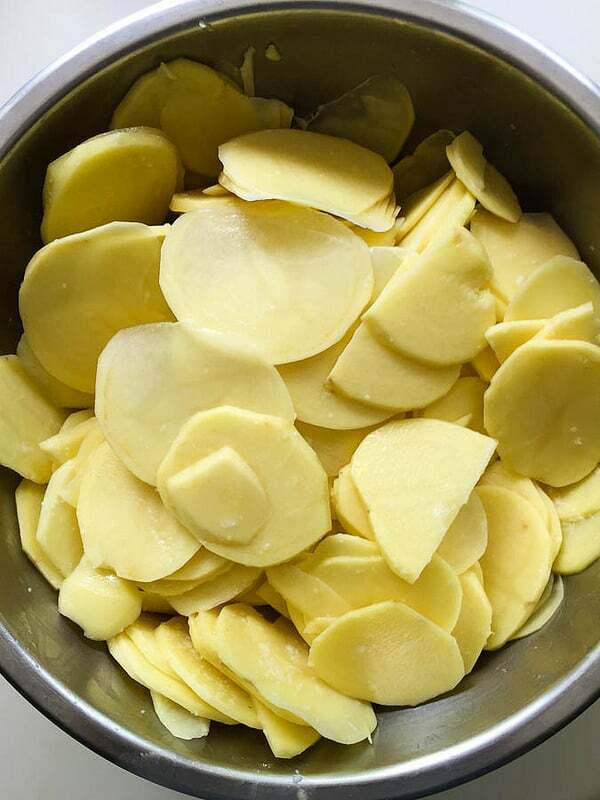 I’m not sure how accurate that is compared to what Sullivan Street really uses in their bakery, but I found that amount of potatoes to be a little too much and so I would recommend using more like 3 pounds as Chad Robertson recommends in his recipe for potato pizza. Just tailor this according to how potato-y you want your pizza to be. 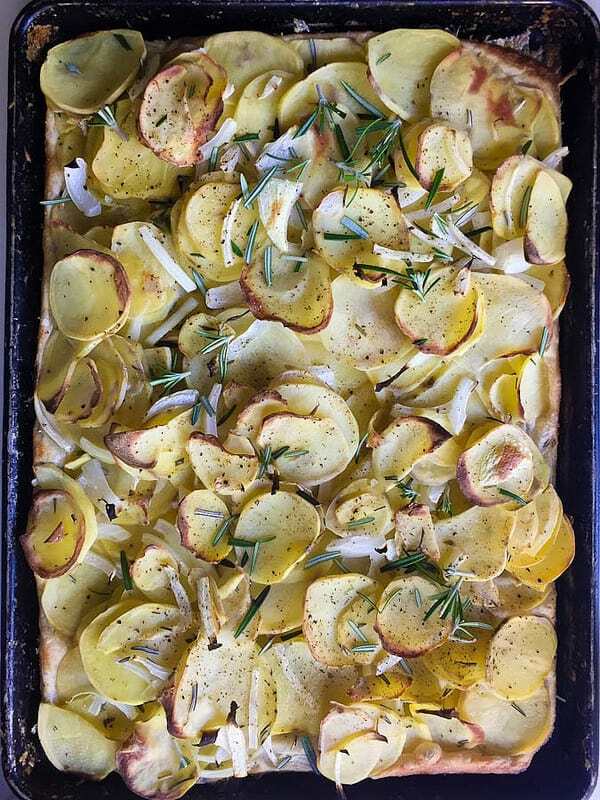 The potatoes are sliced very and tossed with onion and rosemary. If you’re not a lover of fresh rosemary, you could try using fresh thyme instead. 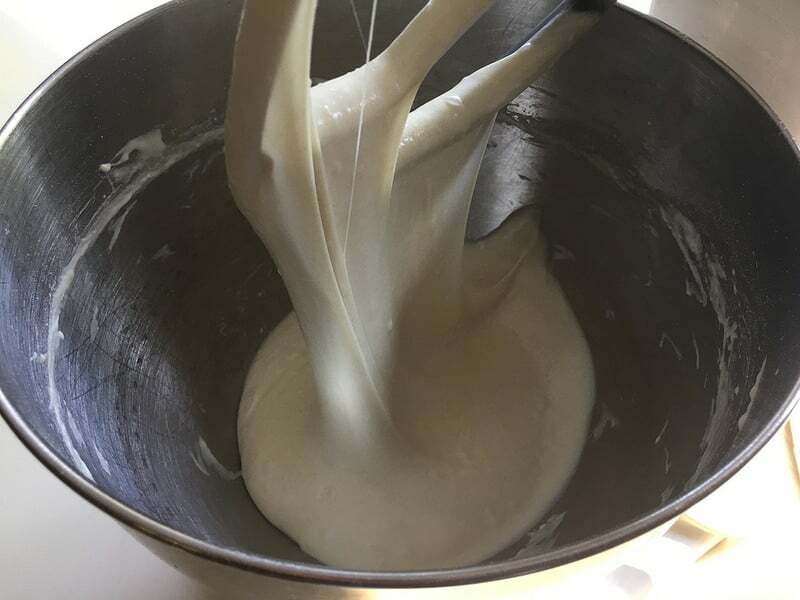 Combine flour and yeast into a mixing bowl of a standing mixer. Using the paddle attachment, mix on low while slowly adding the water. Beat for 3 minutes, until combined and then increase speed and beat until a very wet dough forms, about 20 minutes (see photo) Add sugar and salt and mix for another 3 minutes until dissolved. Cover the dough and let rise for about 4 hours, until it is very light. 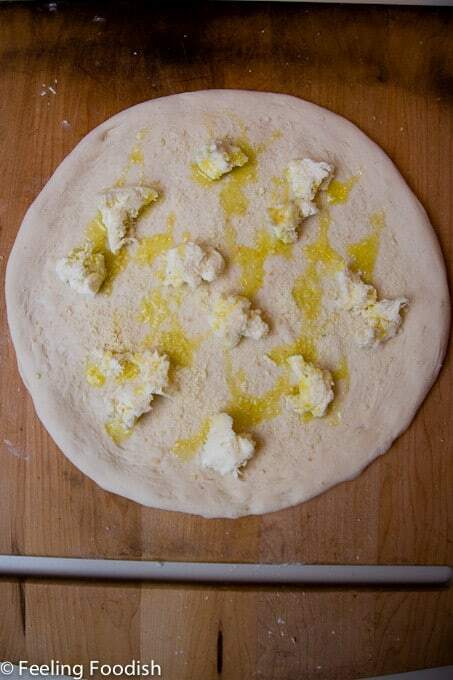 Then, lightly coat a 1/2 sheet pan or two 9x12 pans with olive oil, and place dough on pan. 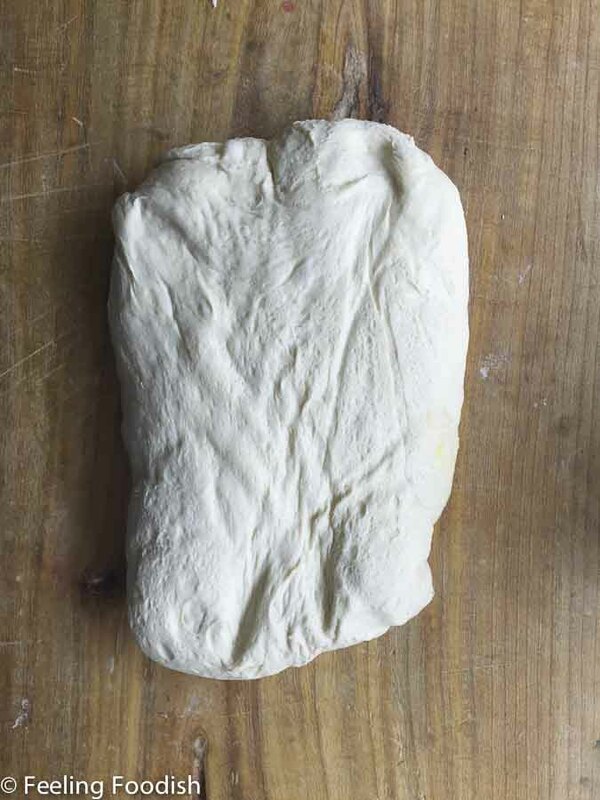 Coat hands with olive oil and spread dough. 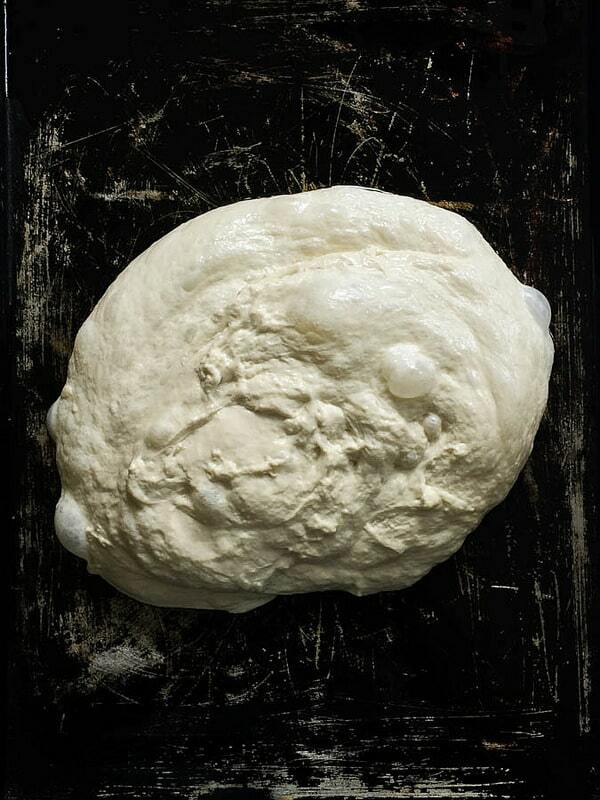 Let dough rest for a few minutes every few minutes if it is difficult to spread. Cover the pan and let rise for about 1 hour until is it risen by half. About 30 minutes before baking, preheat the oven to 425 degrees F, and arrange a rack on the top shelf for the half sheet pan or top and lower third shelves for 2 pans. Who doesn’t love garlic bread? I know I do! 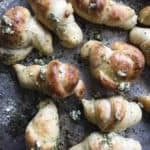 These little garlic knots are so easy to make, and are perfect for nights where a large dinner salad is the main dish. 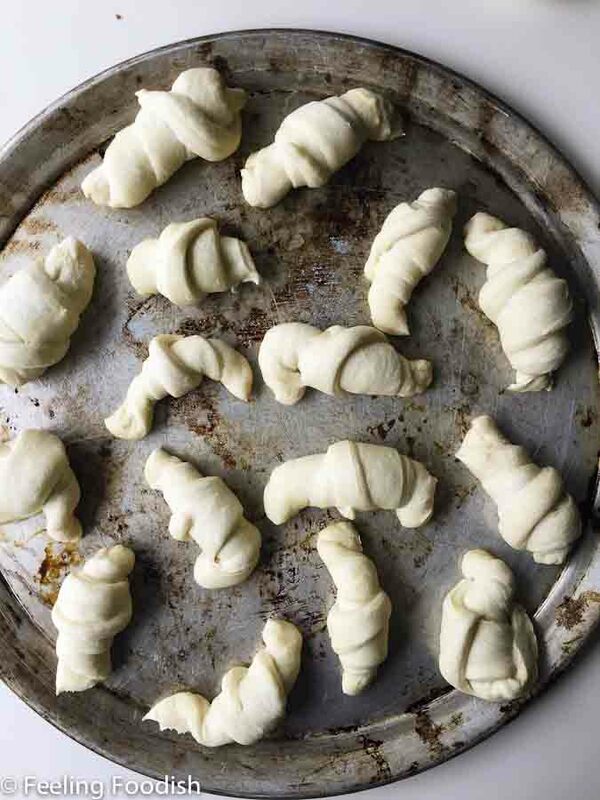 I can’t remember if the photo above was taken before or after rising but you should allow the knots to rise for about 1 or 2 hours (depending on temperature of your kitchen) and then bake them. 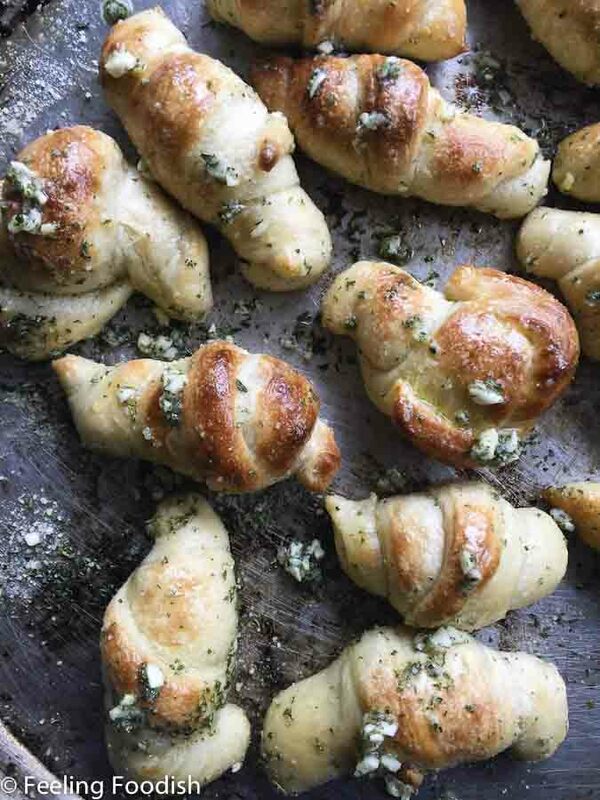 makes 16 garlic knots from pizza dough. 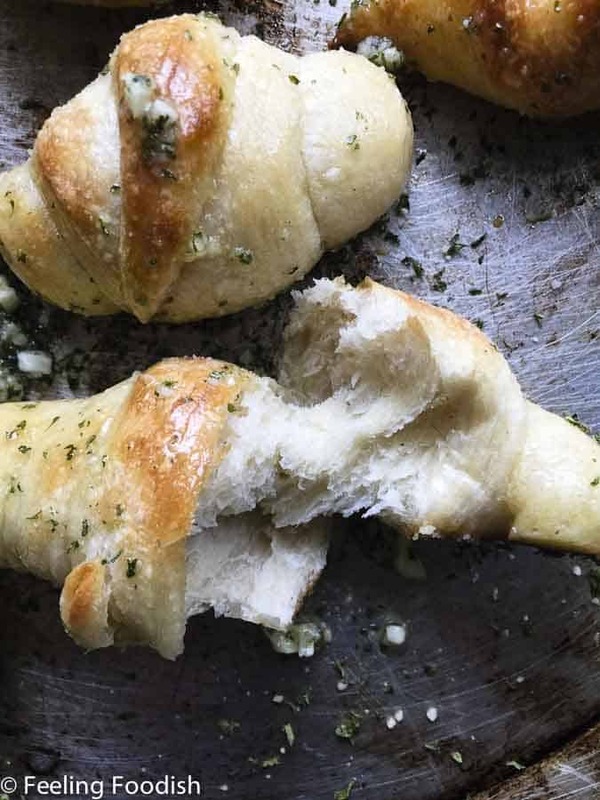 Remove from oven, and when cool enough to handle, place knots into a large bowl and drizzle with olive oil, parmesan cheese, basil, and garlic (all to taste). Toss the knots around in the bowl, until the knots are all coated with the topping and serve warm. Note: I received no compensation for this post; all opinions are my own and I’d just like to share my experience although if you click on “resources tab” and buy through my Amazon store, I receive a small percentage of each sale. Hello there! It’s been a while, and I miss my little bloggie. I’ve still been cooking, baking, and answering pizza questions but not posting too much for a number of reasons. But I’m hoping to get back into something more regular. 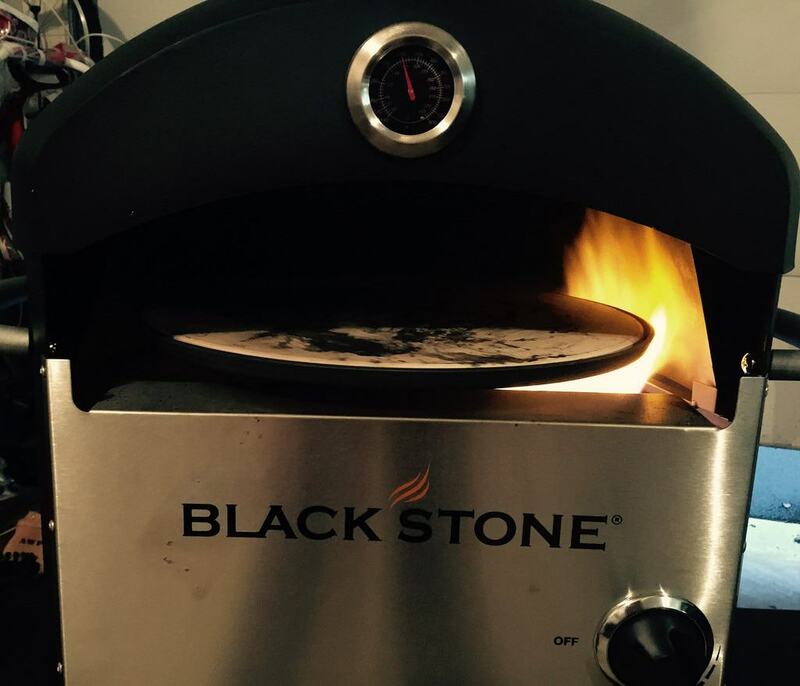 it cooks a pizza in 90 seconds. Yes that’s right NINETY as in one point five minutes. That’s not a typo!! it only takes me 10 minutes to warm it up. I used my favorite NY pizza dough recipe found HERE . 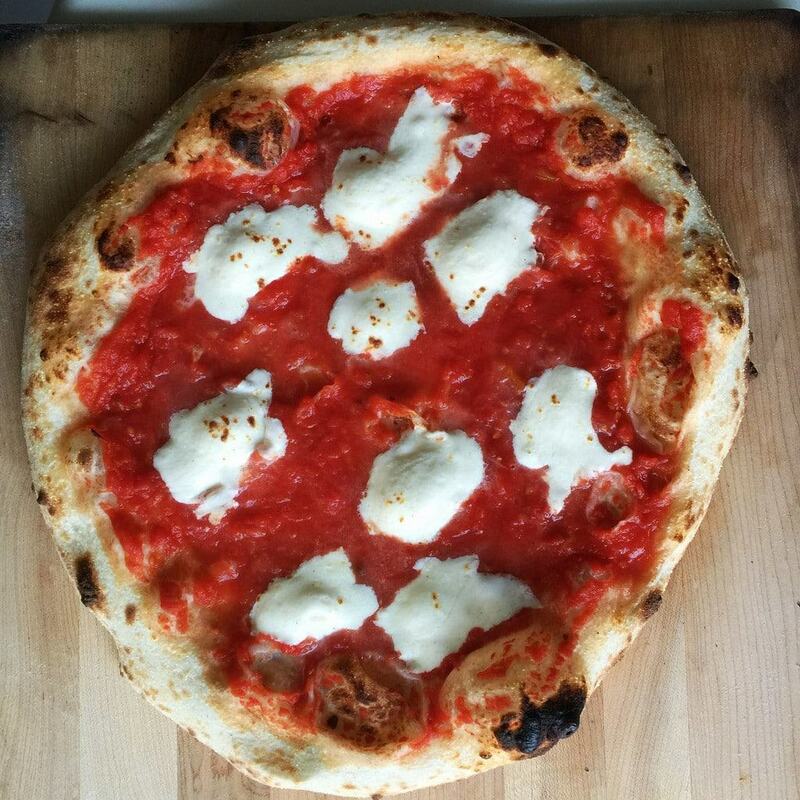 I have also used a beautiful recipe for Neopolitan pizza using Caputo’s Chef’s 00 flour. 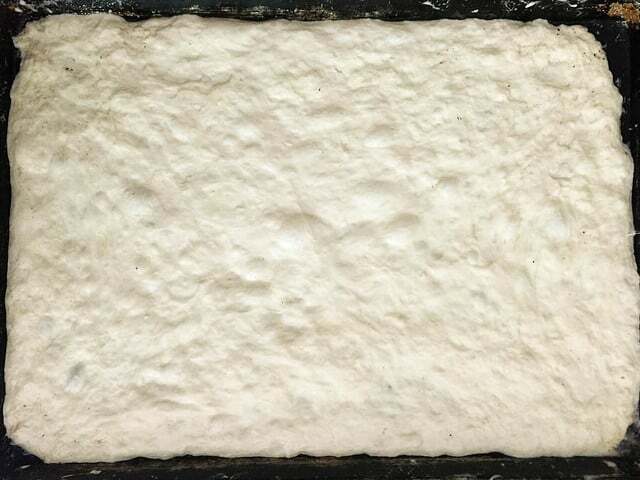 This is rumored to be the same as the Caputo’s Pizzeria flour, milled specifically for baking temperatures over 700 degrees. I followed the usual process except I accidentally left the dough out for a few hours after kneading/mixing. 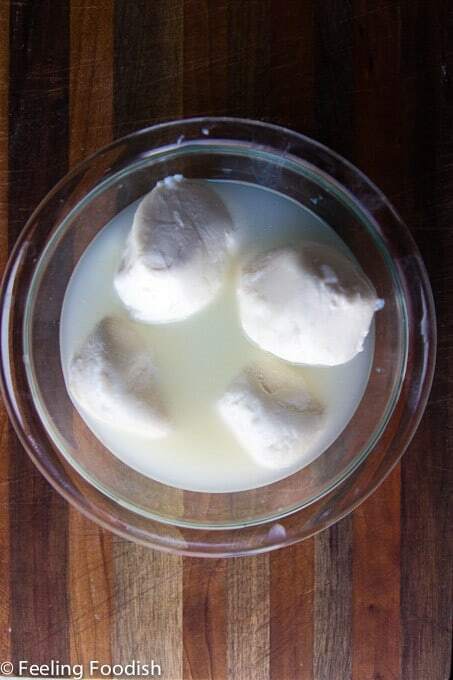 I usually divide and put the dough balls right into plastic containers after mixing. Then, I place the dough balls into the refrigerator for 1 to 3 days. 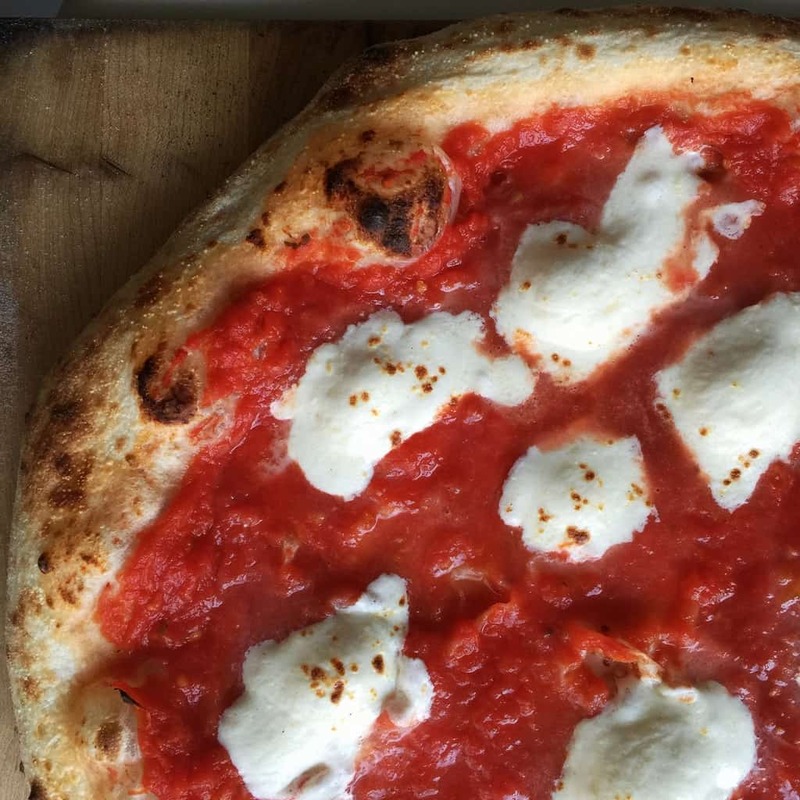 The dough came great as usual but lighter and more like a Neopolitan style pizza. 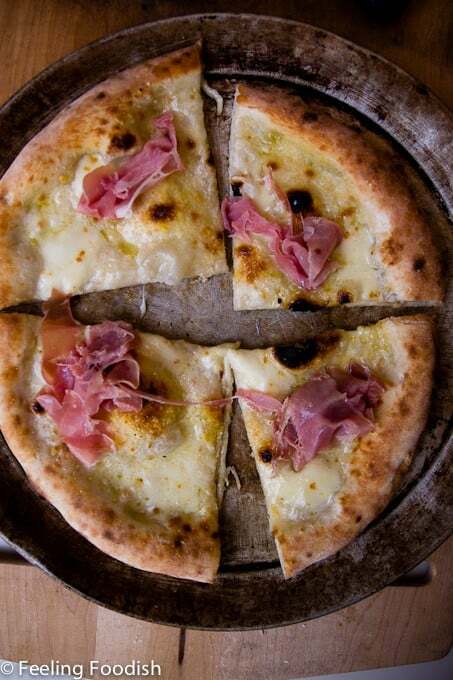 Neopolitan pizzas are charred on the bottom and lighter and fluffier around the cornice. I used 7/11 ground tomatoes (Stanislaus) and topped it with bits of fresh mozzarella (not too much or your pizza will be watery!) Only thing missing is the fresh basil, but alas tis not the season for fresh basil and so I was out of it. From what I understand, the temperature gage on the unit is measuring air temp inside the unit not the stone temperatures. 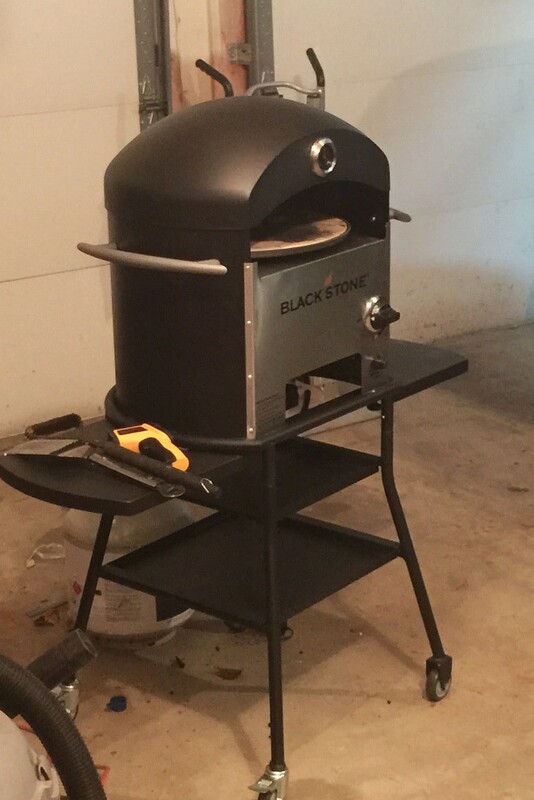 My stones get to an impressive 800 and 900 degrees F within 10 mins! So once in a while, I’ll have an extra dough ball or two because I usually make too much pizza dough. I probably should just freeze a few of the dough balls, to make it easier for the next pizza night, but sometimes experimenting is just more fun. 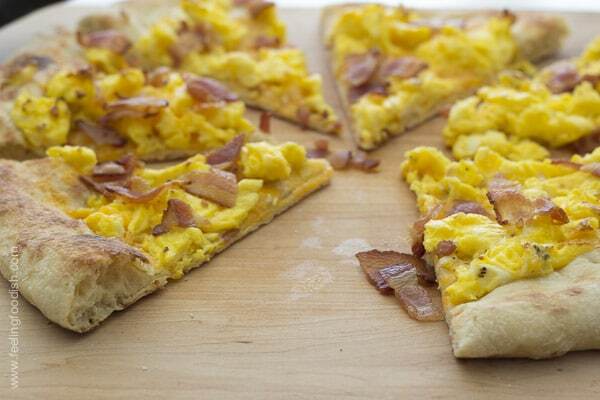 My mom used to make breakfast pizzas now and then. 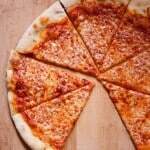 When you really think about it, a pizza shell is nothing more than a blank canvas that can serve as a base for a huge variety of combinations. 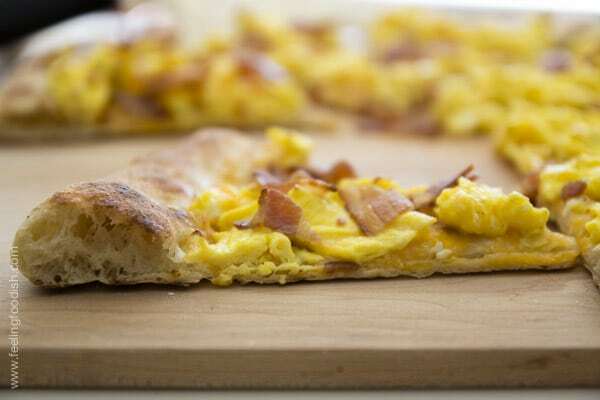 In this case, a giant, open-faced, breakfast sandwich. 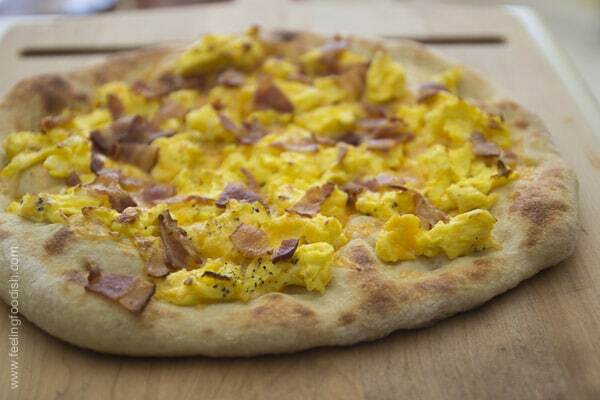 Making this pizza is as easy as scrambling eggs and cooking bacon. 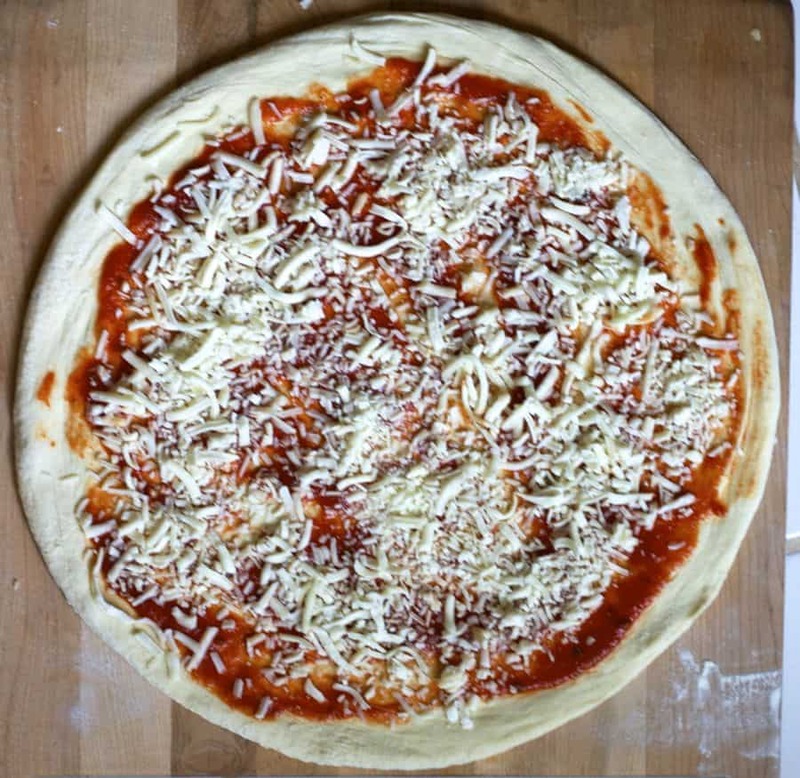 The pizza dough is then shaped, precooked – naked – for a few minutes and then topped with the precooked toppings and cheddar cheese. Diet food, this is not. Although it can probably be easier on the waistline if you use egg whites and Canadian bacon instead of whole eggs and traditional bacon. The cheese can be a low fat version too. 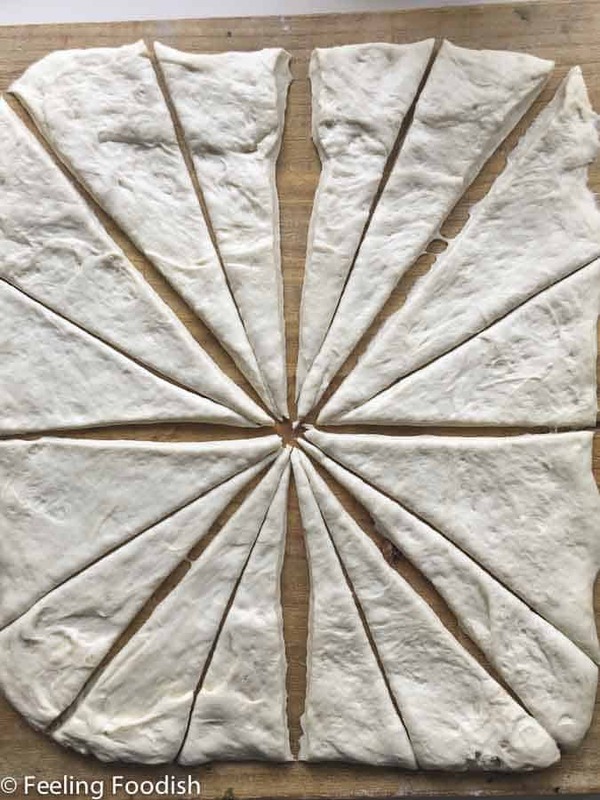 If your pizza dough is already made or you pre-purchase it, this comes together fairly quickly (if you don’t count warming up the oven since the is hands off). Give it a try! I can tell you that I ate waaay to much of this pizza. In a small saute pan, heat the butter over medium heat. Add the egg mixture and cook gently and scramble intermittently. When the eggs are finished cooking removing from heat and set aside. 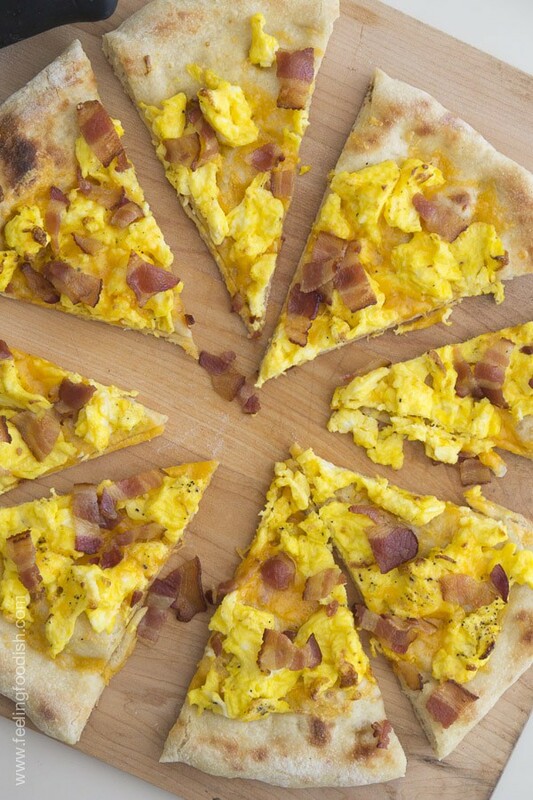 Remove from the oven with the pizza peel and top with cooked eggs, cheese, and bacon. Return the pizza to the oven and cook for another 2 to 4 minutes until lightly browned. 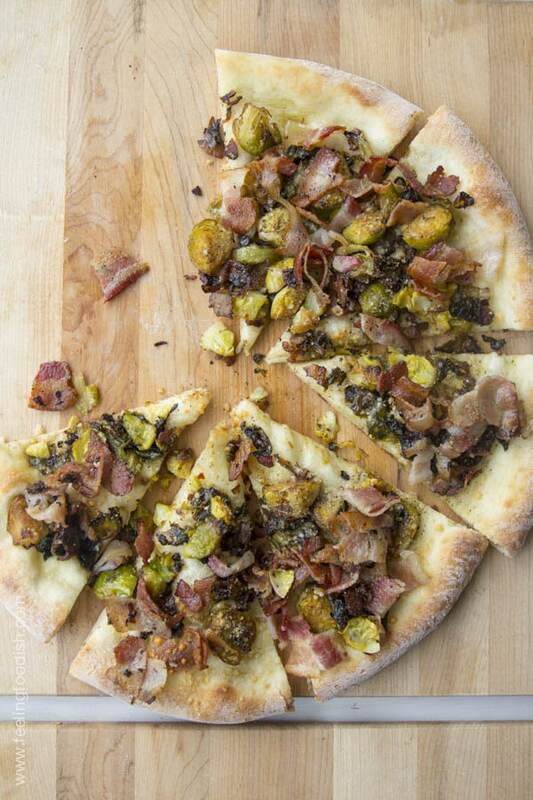 This is a marriage of two loves: white pizza and brussel sprouts. I must admit, I’m fairly new at eating these beauties. I can distinctly remember a time when a cousin of mine was over (he’s a fellow foodie), and we were talking vegetables. He brought up brussel sprouts with much excitement and I pretty much curled up my lip. He was very surprised, and now I know why. I like to blame this on my Italian America upbringing…I think. Really, I’m not sure. Do they eat a lot of brussel sprouts in Italy? I’m still making pizza weekly. 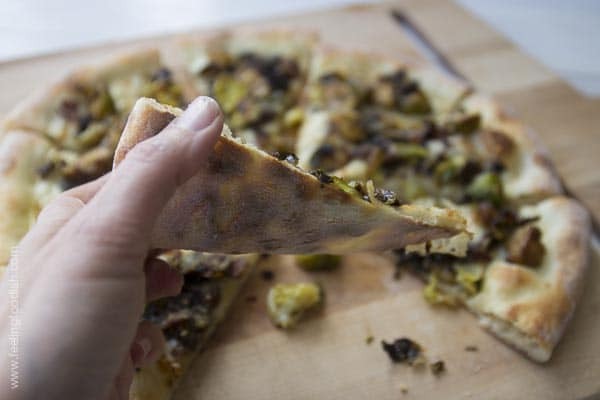 This week it was this brussel sprout pizza, along with my husband’s favorite buffalo chicken pizza, and plain ole regular for the kiddos. Serve a big salad beforehand and call it a meal! My dough was still a bit cold when I took it out of the fridge. 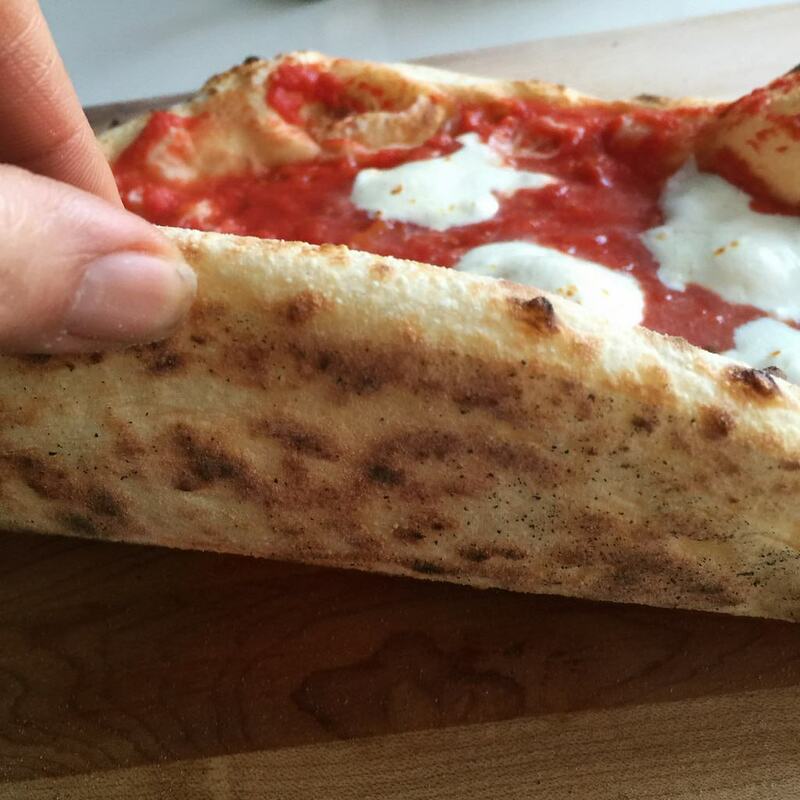 It’s a little harder to stretch when that happens, but the oven spring is great when you use cold dough! One thing that I learned this week is that I prefer balling my dough and then placing it in a plastic container instead of a ziploc baggie since it was a little difficult to take out of the bag, and I had to re-ball it (you can see that in the photo above…bottom of dough ball). It worked out okay though. While I usually roast the brussel sprouts, I opted to cook them in the cast iron pan. I used to hate cooking in my cast iron pan, probably because I need to season it better, but I’ll revisit that when I can use the outdoor grill again in the spring. 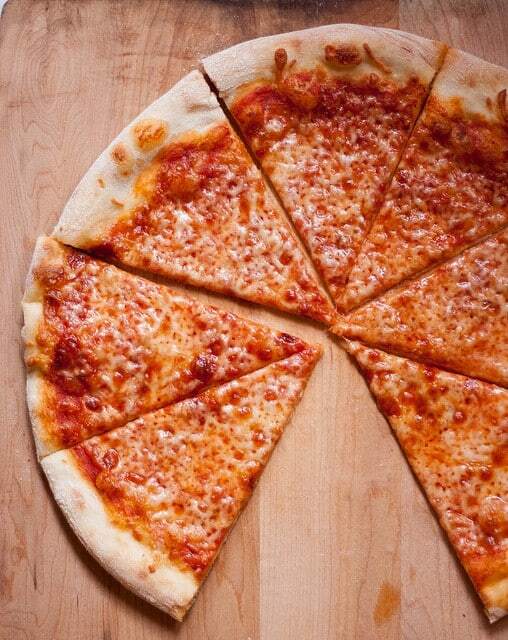 This pizza was cooked on a baking steel. I used my IR gun to test the temperature of my baking steel and it doesn’t seem to get as hot as my baking stone did. I’m not sure if this is because this baking stone is not as thick as my stone was or if because of the materials used…the bottom of the pizza cooked fairly well though. So, it’s all good! Wash and trim brussel sprouts, cut into halves or quarters (depending on size) and set aside. 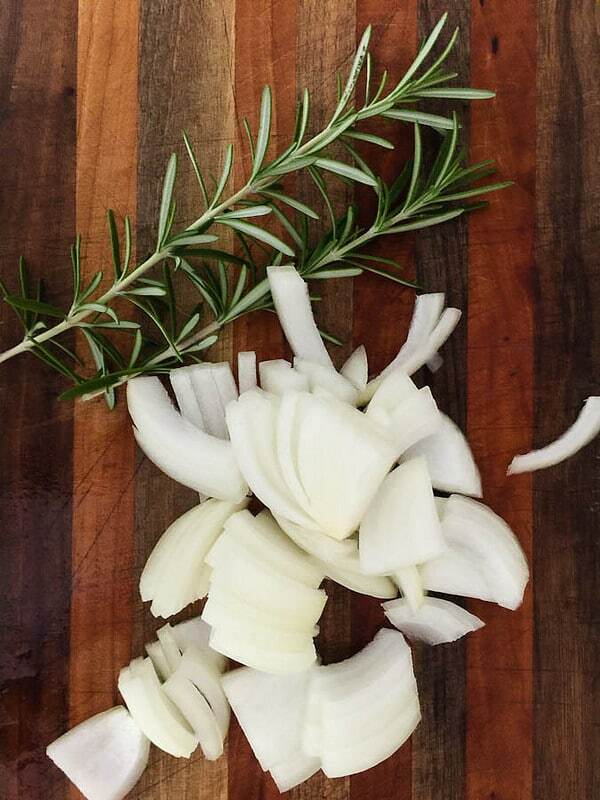 In a cast iron pan (or nonstick pan), heat 2 tablespoons olive oil over medium-high heat, and add garlic and onions. Stirring constantly to prevent garlic from browning, continue to cook for about 2 minutes. 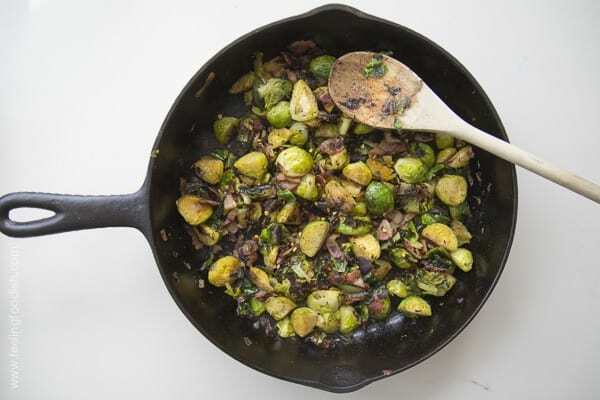 Add brussel sprouts and reduce heat to medium and continue cooking for about 10 minutes or until tender. Stir occasionally and scrape the bottom of the pan to prevent sticking. Remove from heat and season with salt, fresh ground pepper, and red pepper flakes. Add 1/2 of the bacon and gently combine/stir. 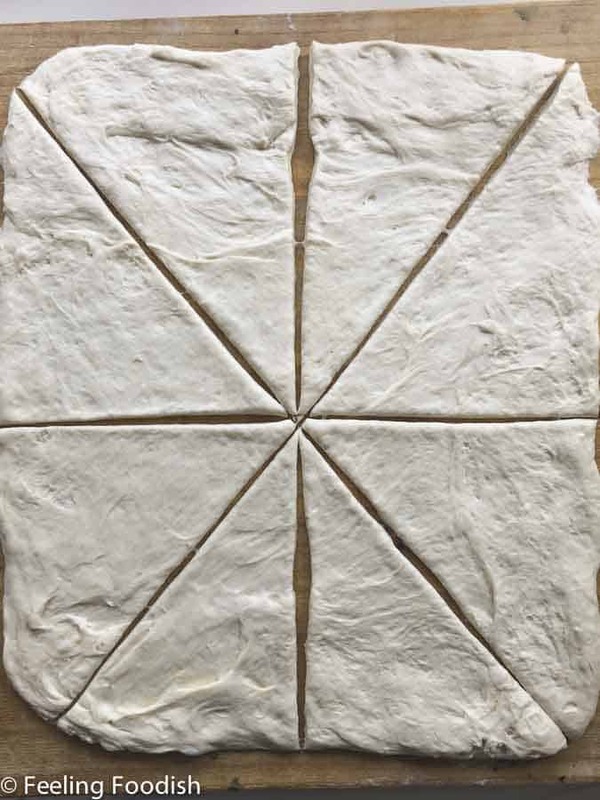 Set pizza shell on pizza peel or parchment paper, and then drizzle with a bit of olive oil. Scatter brussel sprout on top and add the remaining bacon. 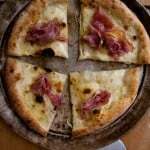 Transfer pizza to pizza stone and reduce heat to 500 and bake for 5 to 7 minutes or until browned. 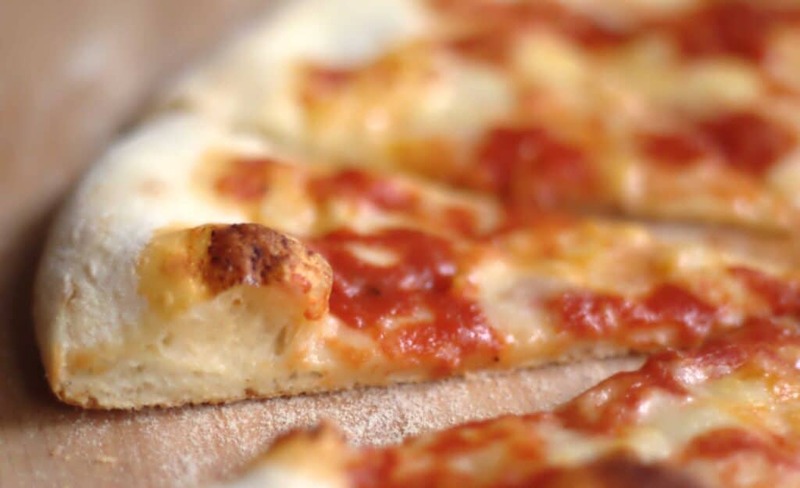 Remove from oven with pizza peel, slice and serve.